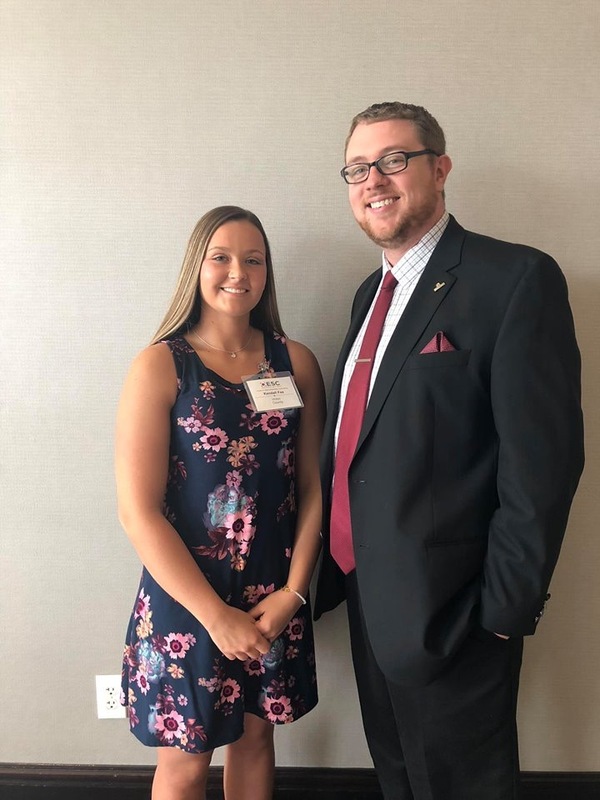 Congratulations to Vinton County High School senior Kendall Fee on receiving the Franklin B. Walter Award (representing Vinton County) from the Ohio Educational Service Center Association! She was recognized at a luncheon Thursday, April 11, with Keynote Speaker Governor DeWine. Kendall is pictured with VCHS Principal, Josh Tripp. Click More+ for additional pictures, provided by Mr. Tripp. **NEW TO THIS YEAR** Registration will be held one day at each of the elementary buildings. 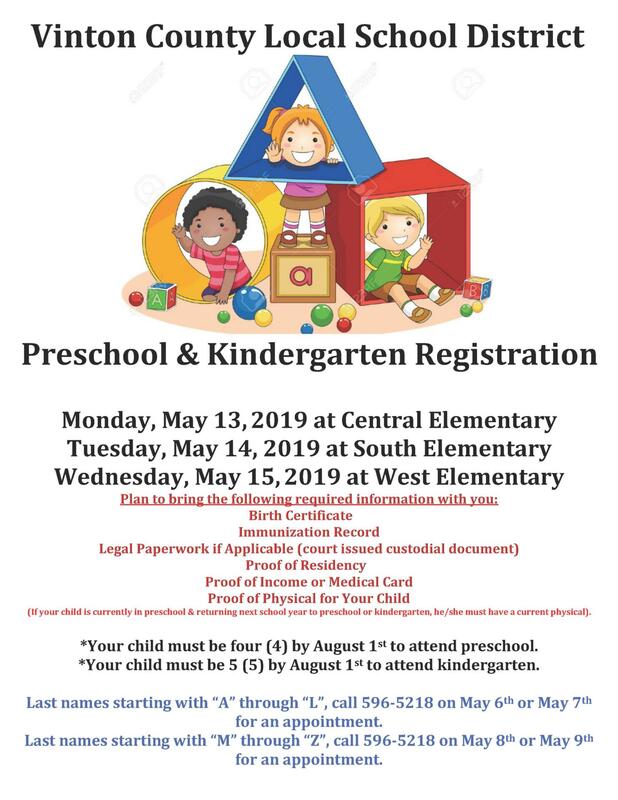 Your child will register at the elementary building they plan to attend. See the flyer for more details. On March 8, 2019, students in Spanish 3 and 4 attended Ohio University to take the Ohio University Spanish placement exam and take a college tour. Students had the opportunity to figure out their current level of Spanish and learn about what the university has to offer. We would like to congratulate all the students who tested out of levels, especially Eli Griffith for holding the highest score with a 438, meaning he will start Ohio University at 3110 Spanish, which will give him the opportunity to work on his Spanish minor. Congratulations to all and a special thanks to a General Mills donation, which funded transportation. Click More + to see additional pictures. The VCHS Athletic Hall of Fame Committee is accepting nominations for inductees for the 2019 Induction Class. Nominations are due by May 1st 2019. You may visit the links below to fill out the online form or you may print out the form and return to Vinton County High School. Mark your calendar - Holzer will be at Vinton County High School on May 2, 2019 to give sports physicals from 9 a.m. to 3 p.m., to students playing sports next school year. Forms for parents to fill out will be coming to the high school and middle school offices in the next few weeks. April Breakfast and Lunch Menus are available online and can be found via the quick links menu on our district website or via the following link. http://www.vinton.k12.oh.us/lunch.aspx. Remember, Breakfast and Lunch are FREE to ALL students. Menus are subject to change without notice. Should an emergency or disaster situation ever arise in our area while school is in session, we want you to be aware that the schools have made preparations to respond effectively to such situations. Should we have a major disaster during school hours, your student(s) will be cared for at this school. Our School District has a detailed emergency operations plan which has been formulated to respond to a major catastrophe. The mission of the Vinton County Local School District is to prepare ALL students for the 21st Century and beyond.